The region of Eastern Kazakhstan is part of the Altai collision system of Hercynides, which is part of the Western sector of the Central Asian Orogenic Belt. The Altai collision system was formed in Late Paleozoic as a result of oblique collision of the Siberian continent and Kazakhstan composite terrane (Vladimirov et al., 2003, 2008; Xiao et al., 2010). Between Siberia and Kazakhstan paleocontinents, in the Devonian to Early Carboniferous, there was the Ob’-Zaisan paleooceanic basin, a fragment of the western sector of the Paleo-Asiatic Ocean (Fig. 1). This basin interacted with continental blocks in the subduction zones (Rudny-Altai and Zharma-Saur terranes). Collisional processes began at the end of the Early Carboniferous. The relicts of the oceanic crust and subduction-related sedimentary and volcanic complexes were preserved within the Central part of the Altai collision system as numerous tectonic blocks and plates. Marine sedimentation ceased from the beginning of the Late Carboniferous. Thickening of the crust and associated orogeny is indicated by the Late Carboniferous continental molasses deposits with basal conglomerates that were formed in several intermountain depressions. From the end of the Carboniferous sedimentation ceased and the territory developed in the intraplate regime. Figure 1. Tectonic scheme of Altai collision system (also known as the Ob-Zaisan folded belt), after (Vladimirov et al., 2003). 1 – Early- and Middle-Paleozoic geotectonic complexes of Siberian and Kazakhstan continents; 2-6 – marginal and oceanic terrains of Middle-Late Paleozoic (Hercynides): 2 – Kolyvan-Tomsk terrain of passive margin; 3 – Rudny Altai terrain of active margin; 4 – Zharma-Saur island-arc terrain; 5 – Char oceanic terrain; 6 – Kalba-Narym turbidite terrain; 7 – Kuznetsk sedimentary basin (Pz3-Mz); 8 – Cenozoic sedimentary deposits; 9 – granitoids C1-J1, undivided; 10 – faults: a – reliable; b – supposed; c – supposed under Cenozoic deposits. The main flash of magmatic activity in Eastern Kazakhstan falls in Early Permian time. During the time interval from 300-295 to 275-270 Ma voluminous magmatism occurred in the region (Fig. 2). This included a variety of volcanic, subvolcanic and intrusive formations, that range in composition from ultrabasic to felsic. Figure 2. 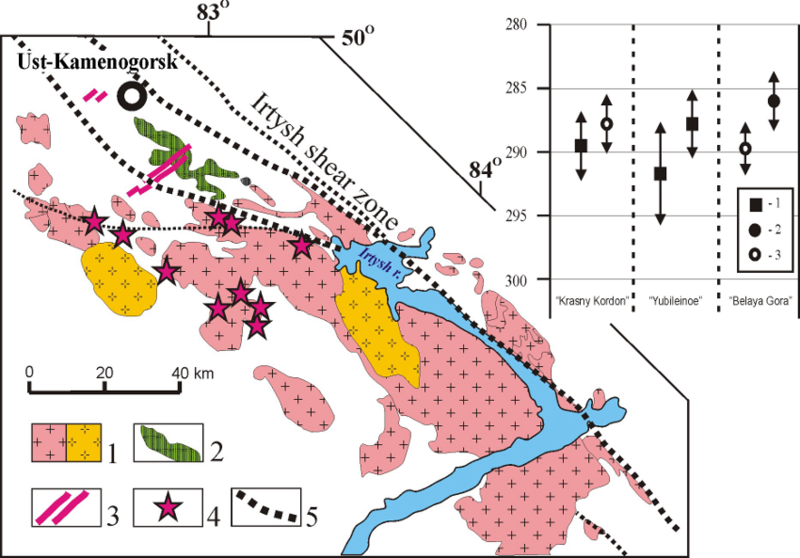 Geological map of Central part of Altai collision system (Eastern Kazakhstan), after (Khromykh et al., 2017b). 1 – serpentinite melange and other rocks of Char ophiolite belt (?–O); 2-11 – geotectonic complexes of accretion-collision stage of evolution: 2 – sedimentary and volcanic deposits (?–O) in Zharma-Saur zone; 3 – sedimentary deposits and basalts (O3–S–D2-3) in Char zone; 4 – volcanic deposits of middle and felsic composition (D1-2) in Zharma-Saur zone; 5 – andesites and basalts (D3) in Zharma-Saur zone; 6 – sedimentary and volcanic deposits (D2) in Rudny Altai zone; 7 – terrigenous deposits (D3-C1) in Kalba-Narym zone; 8 – terrigenous deposits C1; 9 – basalts and andesites C1; 10 – gabbro intrusions of Saur complex (C1) in Zharma-Saur zone; 11 – granite intrusions of Bugaz complex (C1) in Zharma-Saur zone; 12-19 – syn- and post-orogenic geotectonic complexes: 12 – molasses with basal conglomerates C2; 13 – gabbro intrusions of PriIrtysh complex (C2) in Kalba-Narym zone; 14 – volcanic covers P1 in troughs: a - andesites and basalts, b - dacites and rhyolites; 15 – gabbro (Argimbai complex) and picrite (Maksut complex) intrusions (P1) in Char zone; 16 – gabbro-granite intrusions of complicate structure (P1) in Char zone; 17 – granitoids (P1) of granodiorite-granite association; 18 – granitoids (P1) of leucogranite-granite association; 19 – post-batholith dikes belts of Mirolyubovka complex (P1-2); 20 – faults; 21 – Cenozoic sedimentary deposits. In the central part of the region there are several volcanic troughs which are filled with subalkaline basalts, andesibasalts and andesites. Some troughs in the south-east of the territory are filled with dacites and rhyolites. Volcanic-bearing troughs are accompanied by small subvolcanic extrusive bodies composed of andesite porphyrites and dacite porphyries. Mafic volcanic rocks are characterized by high alkalinity (Na2O + K2O from 3.2 to 9.2 wt. %), a high concentration of potassium (K2O up to 4.9 wt. %), alumina (Al2O3 from 14 to 23 wt. %), phosphorus (P2O5 up to 1 wt. %) and titanium (TiO2 up to 1.5 wt. %). They are also enriched in K, Ba, Zr and light REE (Fig. 3). The 297±2 Ma age of the volcanic rocks was determined by U-Pb dating of zircons (LA-ICP-MS) from subalkaline andesites. Felsic volcanic-bearing troughs are accompanied by subvolcanic bodies of Grt-dacites and CPx- andesites. Study of these rocks showed that their magmas were generated in the lower crust (~10 kbar, 1000–1200ºC) as a result of the partial melting of crustal substrates under the influence of high-temperature mantle melts (Khromykh et al., 2011). Figure 3. 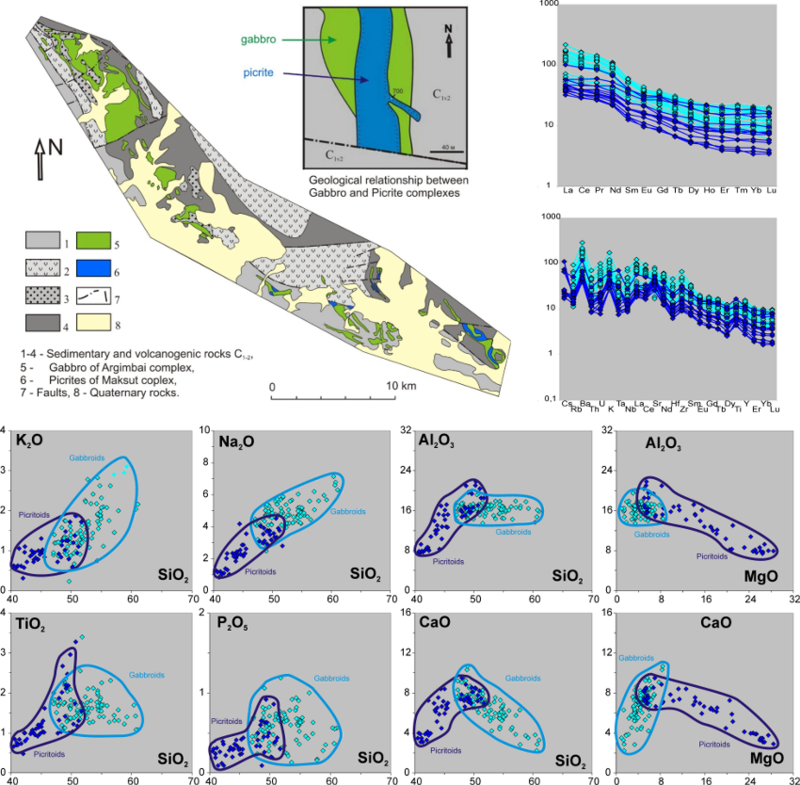 Composition of basalts and andesites from volcanic troughs on TAS-diagram, Zr-Zr/Y diagram, REE spectrum and RE spectrum. There are about 50 small intrusions (the largest has an areal extent of about 60 km2) that consist of gabbro, or gabbro and picrites. The rocks of the massifs were divided into two complexes – 1) Argimbai plagiosyenite-gabbro (older) and 2) Maksut gabbro-picrite (younger). The age of Argimbai gabbro was determined as 293±2 Ma by U-Pb dating of zircons (SHRIMP-II). The age of gabbro and picrites of the Maksut complex were determined as 280±3 Ma by Ar-Ar dating of biotite (3 samples from 3 different massifs) and amphibole (1 sample from Maksut massif) (Khromykh et al., 2013). Gabbroids of the Argimbai complex, as with picritoids of Maksut complex, possess enhanced alkalinity (Na2O+K2O from 5.2 to 7.8 wt. % in gabbroids and from 2 to 5 wt. % in picritoids), enhanced content of potassium (K2O to 2.8 wt. % in gabbroids and to 1.3 wt. % in picritoids) and phosphorus (P2O5 to 0.8 wt. % in gabbroids and to 0.3 wt. % in picritoids). The enhanced contents of LREE, Ba (up to 1000 ppm), Sr (up to 980 ppm), Zr (up to 350 ppm), Rb (up to 25 ppm) are typical for gabbro of the Argimbai complex. 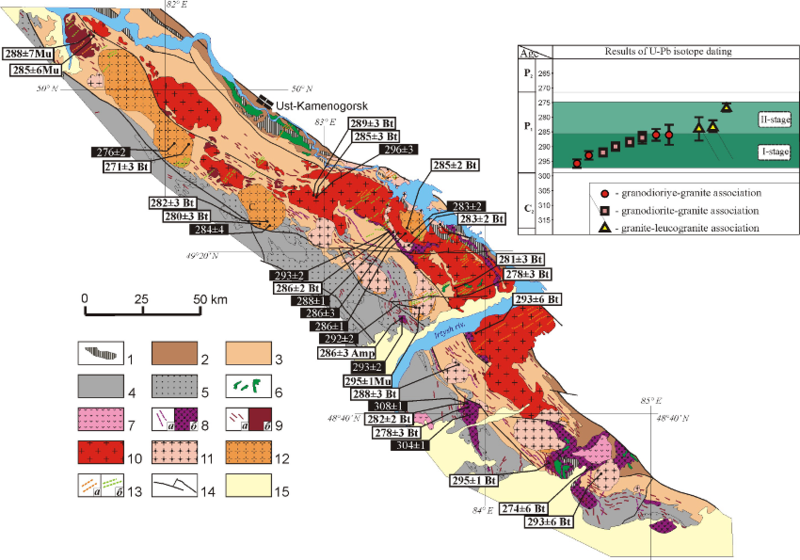 Concentrations of rare and rare-earth elements in picrodolerite and picrite of Maksut complex are lower in comparison with gabbro of the Argimbai complex but higher than typical in ultrabasic rocks (Ba up to 280 ppm, Sr up to 830 ppm, Zr up to 110 ppm, Rb up to 8 ppm, Fig. 4). The Ti mineralization is associated with gabbro of Argimbai complex, and sulfide Cu-Ni and noble-metal mineralization is associated with picrites of Maksut complex (Mekhonoshin et al., 2017). Figure 4. Geological relationship and composition features of gabbro (Argimbai complex) and picrites (Maksut complex). In central part of region, in meta-sedimentary and meta-volcanic units, there are 3 intrusions that have a complicated structure – the Preobrazhenka, Tastau and Delbegetei massifs. These gabbro-granite intrusions each have large size (from 100 to 300 km2) and isometric shape (Fig. 5). They comprise two groups of rocks: 1) Mafic rocks, represented by dolerites (Ol+OPx+CPx+Pl+Bt), Bt gabbro (Pl + CPx + Bt ± Amp), and monzodiorites (Pl + Amp + Bt ± CPx); and the 2) Granitoid rocks, represented by Qtz monzonites (Pl+Kfs+OPx+Amp+Bt+Qtz), granosyenites (Pl + Kfs + Qtz + Amp + Bt), granites (Qtz + Pl + Kfs + Bt + Amp) and leucogranites (Qtz + Pl + Kfs ± Bt ± Grt). Rocks of these groups were produced during differentiation of different parental magmas. Evidence of magmatic mingling is evidence for synchronous intrusion of mafic and granitoid magmas (Khromykh et al., 2017a). Figure 5. Geological scheme of Preobrazhenka massif (Khromykh et al., 2017a, b). 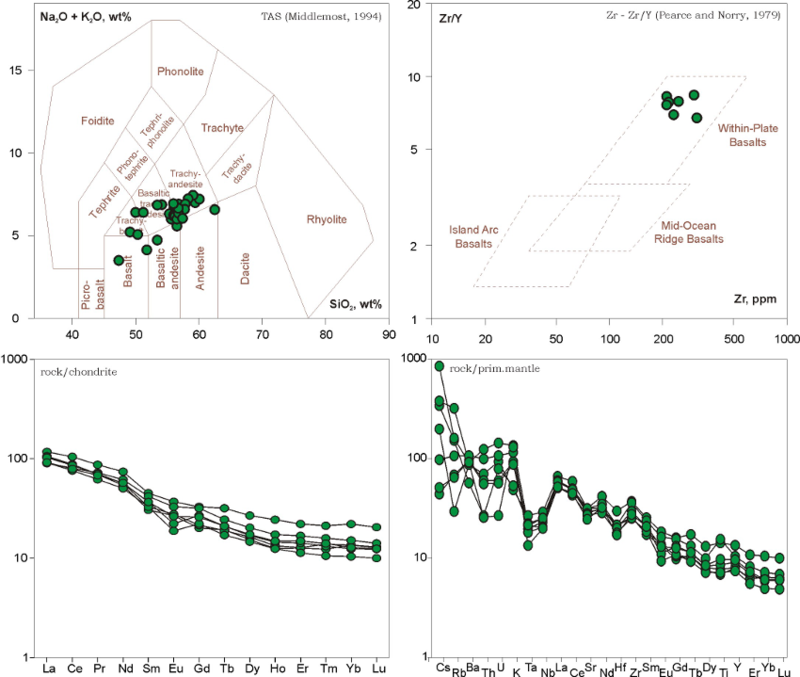 1 – host rocks (hornfels on sandstones and siltstones); 2 – monzonites and Qtz monzonites of 1st phase; 3 – monzogabbro of 2nd phase; 4 – granosyenites and granites of 3rd phase; 5 – monzodiorites of 4th phase; 6 – after-intrusion dikes of dolerites (a), granosyenite-porphyres (b); aplites (c). The blue circles indicate the revealed manifestations of the mingling relationships between granosyenites of 3rd phase and monzodiorites of 4th phase. Photos illustrate the relationships between igneous rocks. Above - nodules of monzodiorites (dark gray) and porphyritic granosyenites (light gray) in granites of the 3rd phase. Below - contact of monzodiorites and porphyritic granosyenites, outcrop and scan image from the sample. Compositions of mafic and granitoid rock groups have independent trends on two-component diagrams (Fig. 6) and show distinct differences in contents of Al2O3, MgO, CaO and Rb, Ba, Zr, La, and Eu. Mafic subalkaline rocks have heightened alkalinity with K2O up to 2 wt.% in gabbro, and up to 2.5 wt.% in diorites. The LREE are higher than the HREE, and there are also elevated values of Ba, K, Ti, Zr, and Sr. Granitoid rocks characterized by heightened contents of alkalis with K2O from 3 to 6 wt.%; granitoid compositions demonstrate decreasing contents of Al2O3, FeO, TiO2, MgO, CaO, Ba, Sr, and Eu from monzonites to granites and leucogranites. The age of gabbro-granite intrusions was determined as 290±2 Ma by U-Pb dating of zircons (LA-ICP-MS) from granite of the Preobrazhenka massif and as 280±3 Ma by U-Pb dating of zircons (LA-ICP-MS) from granosyenite, and by Ar-Ar dating of biotite, from gabbro of Tastau massif. Figure 6. Composition of rocks of Preobrazhenka intrusion. Three groups of rocks are subdivided: mafic (dolerites and gabbro), felsic (Qtz monzonites, granosyenites and granites) and hybrid (monzodiorites). Detailed petrologic studies of rocks of the Preobrazhenka intrusion showed that mafic rocks were formed from parental trachy-basalt magma in the course fractionation and contamination by crustal anatectic melts. Granitoid rocks were formed as a result of melting of lower- or middle-crust substrates under a thermal effect of mafic magma. The interaction between basaltic magma and granitic anatectic melts occurred at different levels. At the lower-crust level this interaction led to reciprocal contamination of mafic and felsic magmas and manifestation of Qtz-bearing monzogabbro and Qtz monzonites. At the middle-crust level the reciprocal contamination didn’t have a crucial role, and so mingling structures were formed. At the upper-crust level, mafic magmas did not interact with granites and formed only some dykes. In Eastern Kazakhstan there are two large granitoid batholiths that formed during the remelting of terrigenous meta-sedimentary and metamorphic substrates. These are the Zharma batholith in the western part and the Kalba-Narym batholith in the eastern part (see Fig. 2). The Kalba-Narym batholith extends from NW to SE within Kalba-Narym turbidite terrane that was formed as a trench along Rudny Altai – the active margin of the Siberian continent in Late Paleozoic. Traditionally, it was considered that the batholith was related to collision and formed during an orogenic stage. The during of granite formation was earlier estimated to span 50-60 million years from the C3-P1 boundary to the P2-T1 boundary. However, the new petrological and geochronological data obtained over the last few years (Kotler et al., 2015; Khromykh et al., 2016) show (Fig. 7) the duration of granite formation to be 20-25 million years (300-295 – 280-275 Ma, P1). These new ages show that the granitoid magmatism occurred in the post-orogenic stage. The two general complexes of the Kalba-Narym batholith may be subdivided: 1) Granodiorite-granite association with S-type composition formed the main volume of batholith (first phase 296-288 Ma, second phase 286-285 Ma); 2) Leucogranite-granite association with A-type composition formed some large independent intrusions (283-276 Ma). Figure 7. Geological scheme of Kalba-Narym batholith and results of isotopic dating, after (Khromykh et al., 2016; Kotler et al., 2015). 1 – blocks of metamorphic rocks; 2 – sedimentary and volcanic deposits (D2gv); 3 – terrigenous deposits (D3-C1); 4 – terrigenous deposits C1s; 5 – rocks of molasses formation C2; 6 – gabbro intrusions of PriIrtysh complex (C2); 7 – dacites and rhyolites P1 in troughs; 8-9 – “pre-batholith granitoids”: 8 – Kalguta granodiorites and granites (a – dikes, b – massifs); 9 – Kunush plagiogranites (a – dikes, b – massifs); 10-12 – granitoids of Kalba-Narym batholith: 10 – Kalba granodiorite-granite complex; 11 – Kainda granite complex; 12 – Monastery leucogranite-granite complex; 13 – post-batholith dike belts of Mirolyubovka complex (a – felsic, b – mafic); 14 – faults; 15 – Cenozoic sedimentary deposits. 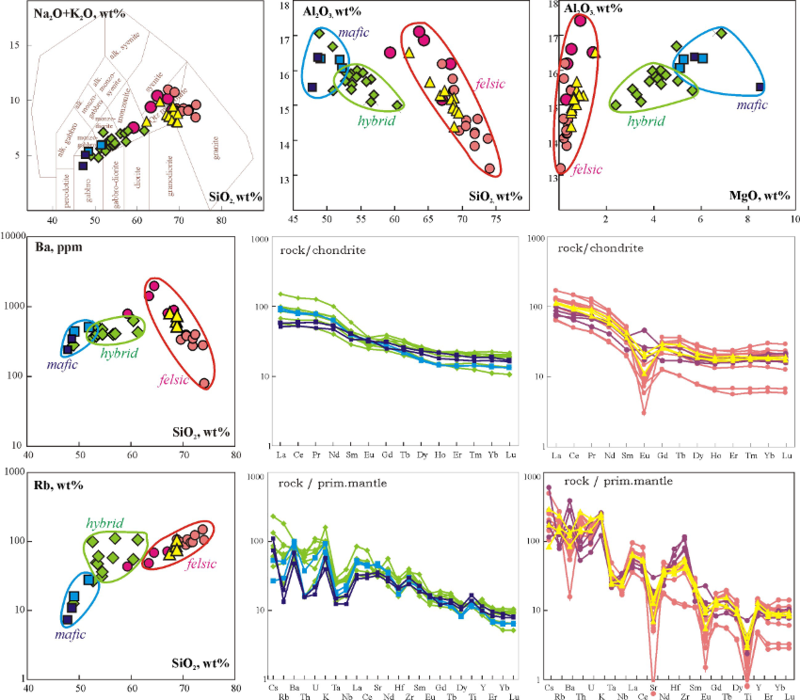 On the sidebar – comparison of the U-Pb isotopic age data of granitoids of the Kalba-Narym batholith. The wide variation in composition (SiO2 = 64-75 wt.%) and trends of decreasing content of all elements besides K2O with increasing silica content, characterize the rocks of the granodiorite-granite association (Fig. 7). These compositions allow classification as S-type granitoids. 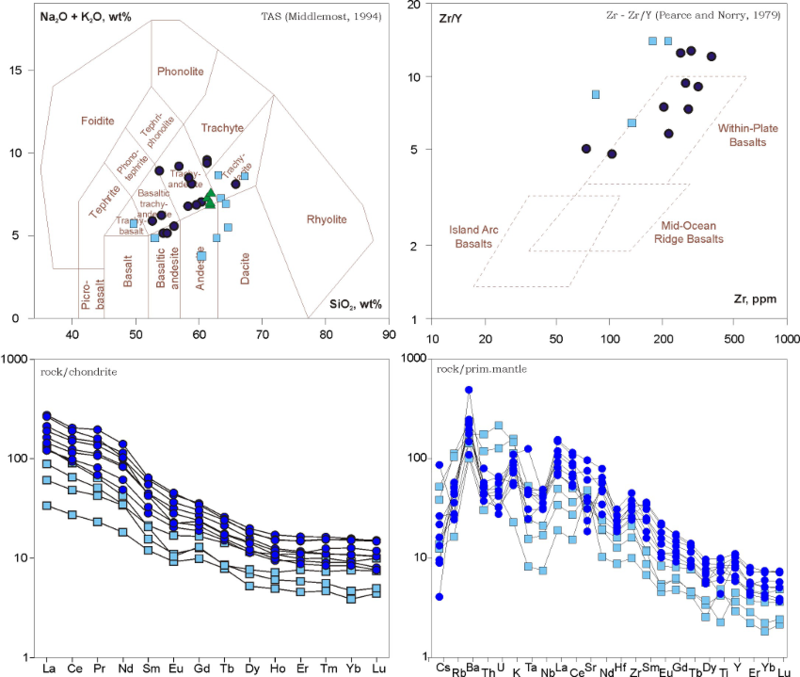 Narrow variations in the composition (SiO2 = 73-76 wt.%) and trends of enrichment in the content of Fe, REE, HFSE (Ta, Nb, Zr, Hf) with increasing silica content characterize the rocks of the granite-leucogranite association (Fig. 8). The increased content of F and Li are typical for rocks of the granite-leucogranite association. The composition of these rocks is more similar to that of A-type granitoids. Figure 8. Compositions of rocks of granodiorite-granite association (red, grey arrows) and granite-leucogranite association (green, white arrows) on two-component diagrams. Considering the gap in the formation time and the fact that the massifs of granite-leucogranite association consist of large independent intrusions, it can be assumed that their appearance was the result of a melting pulse of substrate. Analysis of mineralogy and composition of granitoids from these two associations and the composition of sedimentary and metamorphic rocks and also experimental data about melting of crustal protoliths, permits us to assess the sources and formation conditions of the granitoid magmas. It was determined that formation of granodiorite-granite association (similar to S-type granites) resulted from partial melting of mixed metapelitic and metabasitic substrates. The formation of granitoids of the leucogranite-granite association (similar to A-type granites) resulted from melting of crustal metapelitic substrates but only under conditions in which HSFE and REE were introduced by juvenile fluids that interacted with metamorphic rocks during its melting. The important feature of the Kalba-Narym zone is widespread rare-metal mineralization (Ta, Nb, Li, Be, Sn, W etc.) that are linked with rare-metal granitic pegmatites. The rare-metal granitic pegmatites form veins that intruded granitoids of the 1st phase of the granodiorite-granite association. This relative chronology is confirmed by 40Ar/39Ar isotopic dating: the ages obtained on 12 samples of micas from pegmatites are from 292 to 285 Ma. 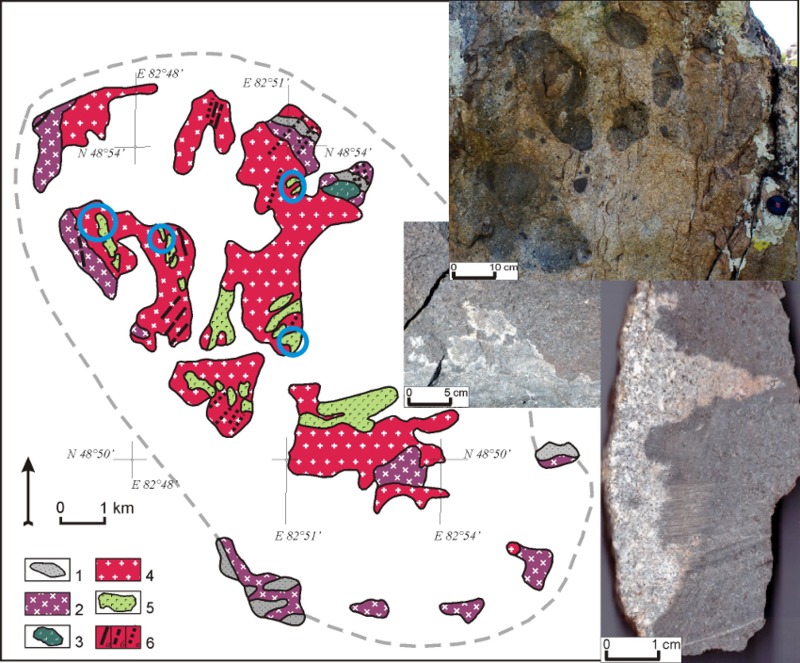 The analog of rare-metal pegmatites are the ongonites and rare-metal granite-porphyres that compose two dike belts near the city of Ust-Kamenogorsk (Fig. 9). In the largest belt, the Chechek dike belt, there are about 15 dikes that with thicknesses of 2 to 5 m and lengths up to several hundred meters. The age of dikes was determined as 286±3 Ma by Ar-Ar dating of liquidus muscovite phenocrysts from the thick ongonite dike (Khromykh et al., 2014). Figure 9. Scheme of rare-metal mineralization in Kalba-Narym zone, after (Sokolova et al., 2016). 1 – granitoids of Kalba-Narym batholith; 2 – gabbro intrusions of PriIrtysh complex; 3 – dike belts of ongonites (out of scale); 4 – manifestations of rare-metal granitic pegmatites; 5 – faults. On the sidebar - distribution scheme of Ar/Ar isotopic ages obtained on micas from rare metal pegmatite deposits: 1 – lepidolite from lithium pegmatites; 2 – muscovite from lithium pegmatites; 3 – muscovite from nonmetallic pegmatites. The dike rocks have high concentrations of rare lithophilic elements and F, which are comparable with the Li-F granites. The dike rocks may be divided into three compositional groups: 1) rare-metal (Li+Rb+Cs up to 1000 ppm, F up to 0.45 wt.%, REE sum = 40–100 ppm); 2) high rare-metal (Li+Rb+Cs up to 2500 ppm), F up to 1.4 wt.%, P2O5 up to 0.35 wt.%, REE sum = 3–15 ppm; 3) ultra-high rare-metal (Li+Rb+Cs up to 4000 ppm), REE sum = 110–180 ppm (Fig. 10). Also, the concentration of “typical granite” rare metals (Sn, Nb, Ta) in dikes is sharply increased in comparison with the usual abundances in granites (Sn in 15-100 times, Nb in 1,5–2 times, Ta in 2-12 times). 1 - rare-metal type; 2 - high rare-metal type; 3 - ultra-high rare-metal type; 4 - compositions of rare-metal granitoids of world; 5 - typical values in granite. Study of mineralogical and geochemical features of dike rocks (Sokolova et al., 2016) indicates formation from granitic melts that were enriched rare metals. It brings them closer to rare-metal granite pegmatites of the Kalba-Narym batholith. We assume that the formation of rare metal rich magmas occurred in the granite chambers of the Kalba-Narym batholith. However, their local manifestation suggests that the processes of generating of rare metal rich magmas was associated not only with granite intra-chamber differentiation, but with the addition of specific compositional components (F, P2O5, rare metals, etc.) together with juvenile fluids. This brings together rare metal magmas by the mechanism of formation with the rocks of the granite-leucogranite association of the Kalba-Narym batholith. The under-crust (magmatic underplate) reservoir with mafic magma can be a source of juvenile fluids which contributed to the formation of rare metal granitic magmas. Within the Kalba-Narym zone this mafic magmatism was represented by some dike belts of the Myrolyubovka complex that intruded all granitoids (see Fig. 2, Fig. 7). There are about 10 dike belts and each contains from 3-4 to 15-20 dikes. All dikes have a north-eastern orientation, and each may be up to 4-5 meters in thick and up to 2-3 km length. In the Mirolyubovka complex there are different dikes but a significant part is occupied by dikes rocks of mafic composition. The Bt dolerites, monzodiorites and lamprophyres (spessartites) are common mafic compositions of the dikes. These rocks are subalkaline and belong to high-K calc-alkaline series, have low magnesia (Mg# ~39 %), and high contents of TiO2 (~1.6 wt.%), K2O (~1.7 wt.%), P2O5 (~0.6 wt.%) and REE (sum ~195 ppm, Fig. 11). In addition, the concentrations in these rocks of rare metals, fluorine and boron are at or above those in the granitoids of the Kalba-Narym batholith: Li = 3-7 ppm, Cs = 0.9-3.5 ppm, Rb = 16-38 ppm, Sn = 0.4-0.8 ppm, Be = 0.1-0.5 ppm, Nb = 12-16 ppm, Ta = 0.7-1.1 ppm, F = 120-140 ppm, B = 1-3 ppm. This suggests the dike mafic rocks are related to those mantle magmas that were the source of rare elements for the processes of enrichment of rare-metal granitic magmas. The age of mafic dikes was first determined as 267±3 Ma by U-Pb dating of zircons (LA-ICP-MS) from lamprophyres of one dike. Figure 11. 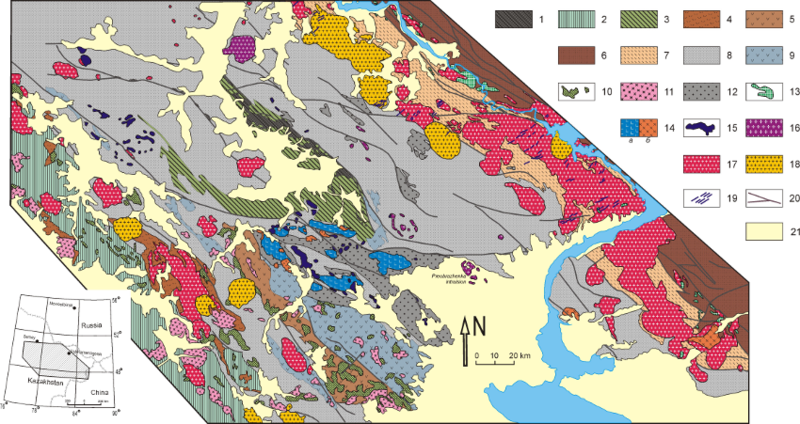 Composition of mafic rocks from dike belts of Mirolyubovka complex on TAS-diagram, Zr-Zr/Y diagram, and REE spectrum. Figure 12. 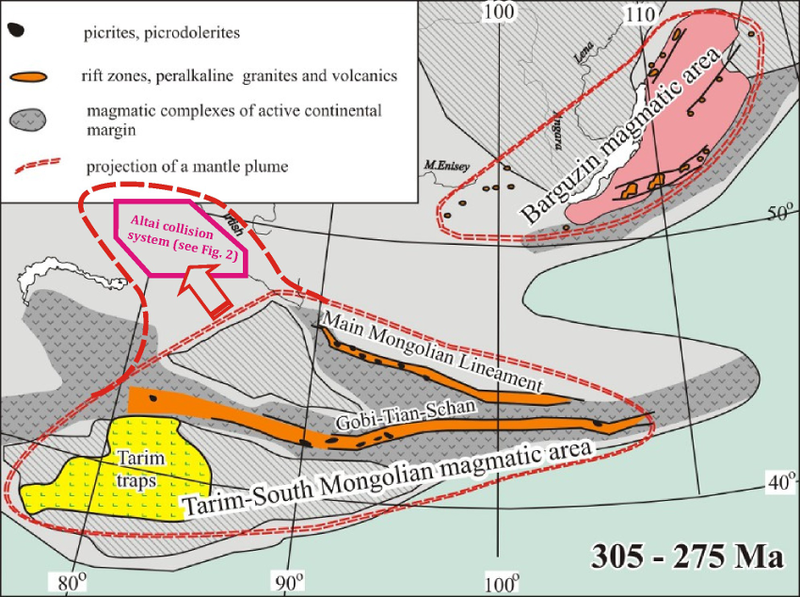 Locations of Early Permian magmatic areas within the margin of the Siberian continent (http://largeigneousprovinces.org/11dec and (Yarmolyuk et al., 2014)) and the expansion of distribution of the Tarim LIP to the north-west. It is also likely that the widespread influence the Tarim LIP was facilitated by the processes of post-orogenic extension of the lithosphere after the Siberia-Kazakhstan collision. This led to a rheological weakening of the lithosphere and made possible the intrusion of deep melts into the sub-lithospheric mantle. It is necessary to note the different permeability of different blocks of lithosphere which led to a different character of the mantle-crust interaction in the different regions (Khromykh et al., 2017b). In central part of the region, where fragments of accretionary and paleooceanic complexes were preserved, the lithosphere was not thick enough, so the mafic magmas could easy penetrate into the lower parts of the crust. The direct interaction of mantle magmas with crustal substrates and anatectic melts is the first mechanism of mantle-crust interaction. As a result, the large gabbro-granite intrusions formed, and volcanic structures and many small gabbro-picrite massifs were emplaced in the central part of the region. The north-east part of the territory was formed as the Kalba-Narym terrane was filled by terrigenous sediments (sandstones and aleurolites) during the Devonian-Early Carboniferous. Under collision processes, these strata were deformed and metamorphosed. An increased temperature gradient from mantle chambers resulted in mass-scale anatectic melting of these substrates. The thick viscous migmatite-granite lenses were formed, through which the mafic magmas could not penetrate (‘density filter’). So the thermal and fluid effect of mantle on crustal substrates was the second type of mantle-crust interaction. This includes the interaction between juvenile mantle fluid and crustal substrates or granites in chambers and the introduction of some specific elements that may cause formation of rare-metal specific granitoids. The intrusion of mafic magmas into the medium- and upper-crustal levels became possible only after the completion of large-scale granitoid magmatism, cooling and cracking of the lithosphere – during which time the dike belts of the Mirolyubovka complex were formed. Thus, the Territory of Eastern Kazakhstan in Early Permian was an example of the interference of plate-tectonic and plume-tectonic factors. Accretion-collision processes were a plate-tectonic and structure-forming factor, and the Tarim mantle plume played the role of an energy source, which caused the manifestation of wide various magmatism. The authors greatly appreciate R.E. Ernst for encouragement and the invitation to write this article for largeigneousprovinces.org. The research was carried out in the V.S. Sobolev Institute of Geology and Mineralogy SB RAS and in Novosibirsk State University with the financial support of the fundamental research program of the Siberian Branch of the Russian Academy of Sciences (project No. 0330-2016-0003), the Ministry of Education of the Russian Federation (project No. 5.1688.2017/PCh), the Russian Foundation for Basic Research (projects No. 15-35-20815, 16-35-00209, 17-05-00825). Khromykh S.V., Burmakina G.N., Tsygankov ?. ?., Kotler P.D., Vladimirov A.G. 2017. Interactions between gabbroid and granitoid magmas during formation of the Preobrazhensky intrusion, East Kazakhstan. Geodynamics & Tectonophysics. 8 (2). p. 311–330. doi:10.5800/GT-2017-8-2-0243. Khromykh S.V., Kotler P.D., Sokolova E.N. 2017. Mantle-crust interaction at the late stage of evolution of Hercynian Altai collision system, western part of CAOB. Geodynamics & Tectonophysics. 8 (3). p. 489–493. doi:10.5800/GT-2017-8-3-0270. Mekhonoshin A.S., Kolotilina T.B., Vladimirov A.G., Sokol'nikova Yu.V., Doroshkov A.A. 2017. First data on the concentrations and distribution of noble metals in Ni-Cu sulfide ores of the South Maksut deposit (East Kazakhstan). Geodynamics & Tectonophysics. 8 (3). p. 515-519. doi:10.5800/GT-2017-8-3-0278. Vladimirov, A.G., Kruk, N.N., Rudnev, S.N., Khromykh, S.V. 2003. Geodynamics and granitoid magmatism of collision orogens. Geologiya i Geofizika. 44 (12). p. 1321-1338. Vladimirov, A.G., Kruk, N.N., Khromykh, S.V., Polyansky, O.P., Chervov, V.V., Vladimirov, V.G., Travin, A.V., Babin, G.A., Kuibida, M.L., Khomyakov, V.D. 2008. Permian magmatism and lithospheric deformation in the Altai caused by crustal and mantle thermal processes. Russian Geology and Geophysics. 49 (7). p. 468-479. doi: 10.1016/j.rgg.2008.06.006. Xiao W.J., Huang B., Han Ch., Sun Sh., Li J. 2010. A review of the western part of the Altaids: A key to understanding the architecture of accretionary orogens. Gondwana Research. 18 (2-3). p. 253-273. doi: 10.1016/j.gr.2010.01.007. Yarmolyuk V.V., Kuzmin M.I., Ernst R.E. 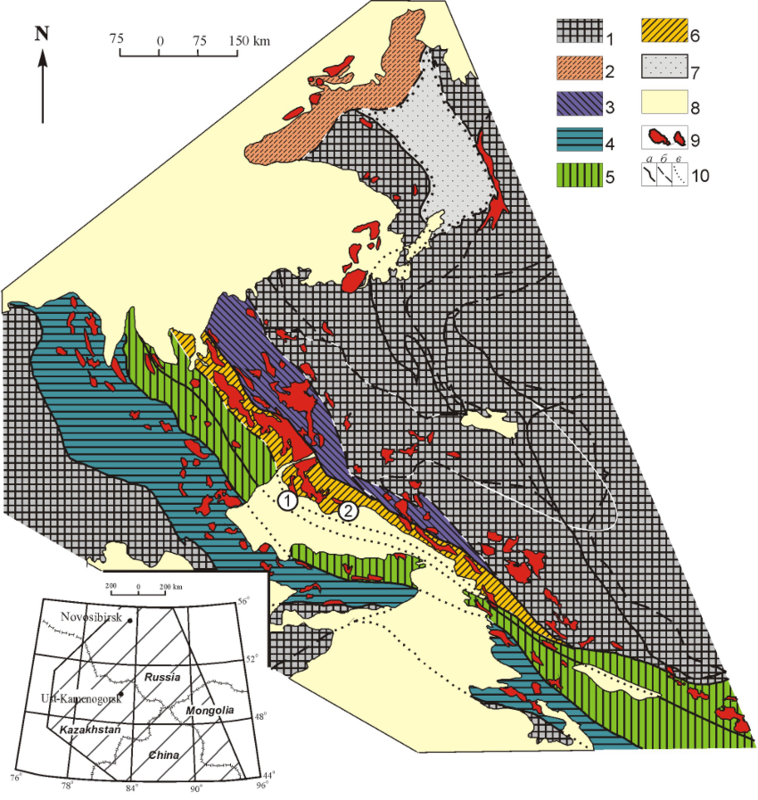 Intraplate geodynamics and magmatism in the evolution of the Central Asian Orogenic Belt // Journal of Asian Earth Sciences. 2014. v. 93. p. 158–179. doi: 10.1016/j.jseaes.2014.07.004.